My husband Dan has a small but dependable repertoire of dishes he likes to make. These breakfast potatoes are on that list, and he cooks them up pretty much every Sunday. 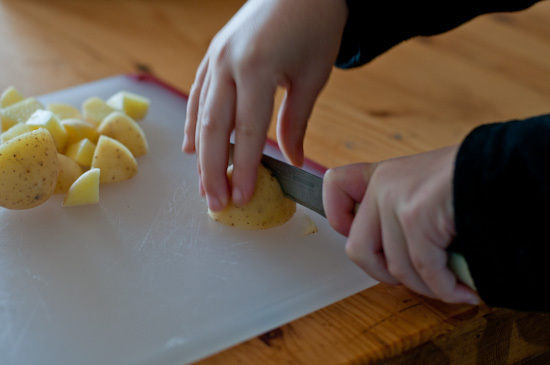 As he got started with preparing them last weekend, he told me I should put these potatoes on my blog. And since I always listen to my husband (ok not always, but a lot), here you go. Dan likes to use small red or white potatoes, but we recently discovered that it’s nice to add some sweet potatoes, too. 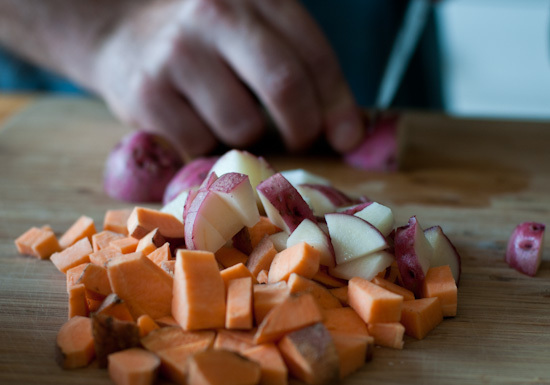 This ups the “healthiness factor” and makes the finished potatoes look really pretty, too. 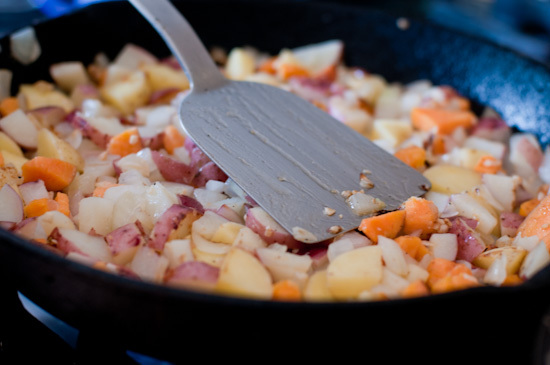 We like our potatoes with lots and lots of onions, which are sauteed in the drippings leftover from cooking pastured bacon (use organic butter or olive oil if you don’t do bacon). When making these breakfast potatoes, you need to work a little at finding the perfect balance between moving the contents of the pan around so everything cooks evenly/nothing burns, and pressing everything down so you get those desirable golden brown edges. 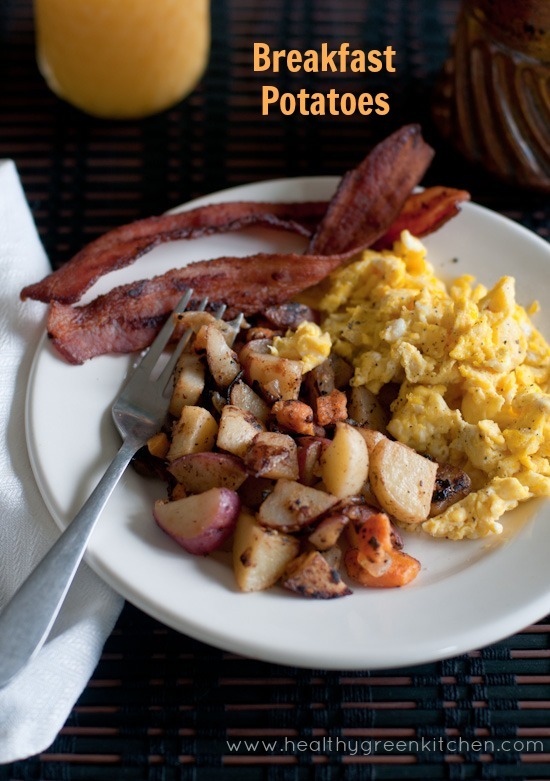 I know there are lots of lots of ways to make breakfast potatoes, but these happen to be our favorite; we love them alongside crisp bacon and eggs from our backyard chickens. What about you? Do you have a favorite breakfast potato method we should know about? Or a favorite Sunday breakfast tradition? Let me know! 1. 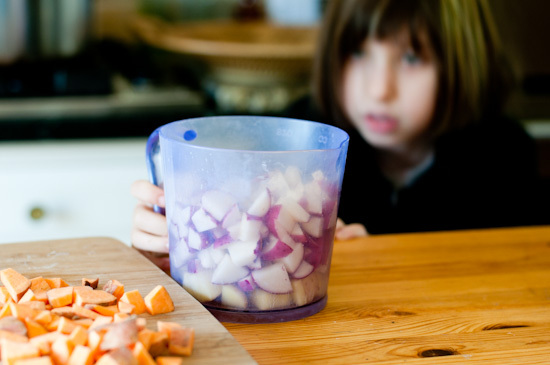 Add chopped potatoes and sweet potatoes to a pot with enough water to cover them. Bring to a boil, then take off the heat and drain. Set aside. 2. If you've cooked bacon (like we often do on Sundays), discard all but about 1 tablespoon of the fat, and add 2 tablespoons of olive oil (if you don't eat bacon or don't want to use bacon fat, use 1 tablespoon butter plus 2 tablespoons olive oil, or use all olive oil). Heat whichever type of fat(s) you want to use over medium-high heat, and add the chopped onion and garlic. Cook, stirring frequently, until very soft and fragrant, about five minutes. 3. Add the potatoes, and cook for another 8-10 minutes. Alternate stirring the contents of the pan around so nothing burns (well to be honest, we like it when the onions burn a bit), and pressing everything down with a spatula so the potatoes get somewhat brown. 4. A liberal sprinkling of coarse sea salt and several grinds of the pepper mill finishes these potatoes off nicely; serve with eggs and optional bacon, doused with a little hot sauce, if you like. Try frying one or two of your chicken’s eggs over the top of the potatoes sometime. That’s really good too! YUM! Can I come over one weekend and hang out with you guys while Dan makes us breakfast? I almost always make a big breakfast on Sundays and it typically involves potatoes and blue cheese crumbles..
Oh I like the tip of pressing down the potatoes.. I will try that, I want em brown! Oh they look delicious with the eggs. Our breakfast potatoes come from leftover cold baked potatoes. I always bake about 3 times the # of potatoes needed. Some become double baked for another night and the rest go in fridge for Saturday am breakfast. So we just slice and add a bunch of sliced onions. This is how my mother did it all our growing up years , in cast iron. We do cast iron also. She used to use butter to fry them, we use oil. We sometimes add sliced peppers. We serve with scrambled eggs and soy sausage and lots of hot tea. Yum I love that you added sweet potatoes. We make ours with green bell peppers. And now I really want some bacon!!!!! I think Dan was right…these are great for your blog. And something I could eat now for dinner much less for breakfast! Oh man! 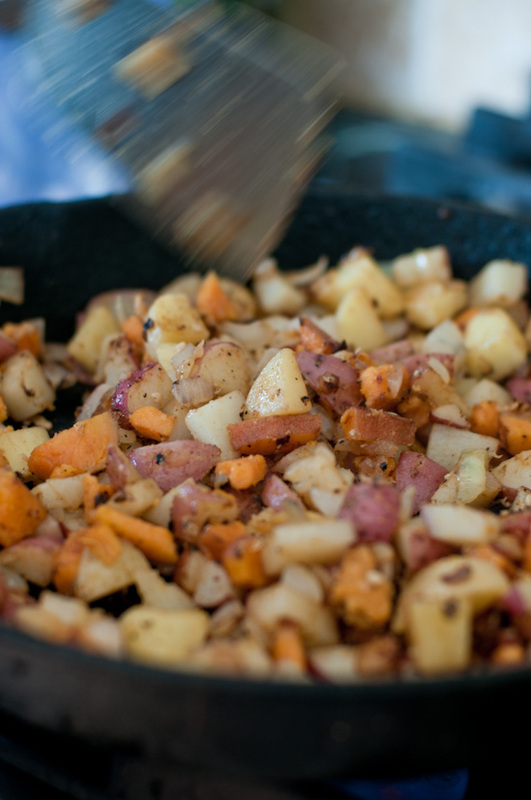 Potatoes for breakfast is a staple in our house…we normally make sweet potato hash browns. 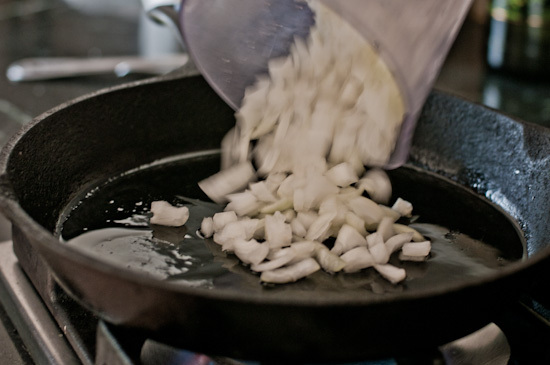 I also like sauteing onions in the bacon droppings or even baking our eggs in the drippings. Sooooooooooo divine! I’ve never had potatoes in the morning (carbs) but these really do sound delicious! Winnie, I LOVE LOVE LOVE breakfast potatoes and am saving your recipe to try. If they’re your favourites they must be GREAT! Cast iron is key. Love the family event of breakfast potatoes! It’s homemade pancakes in our house every Sunday. At this time of year we include freshly picked huckleberries. Thank god tomorrow is Sunday..Brunch :) Oh I am so making these! Hi Winnie, Lovely post. It’s so nice when the whole family gets involved. 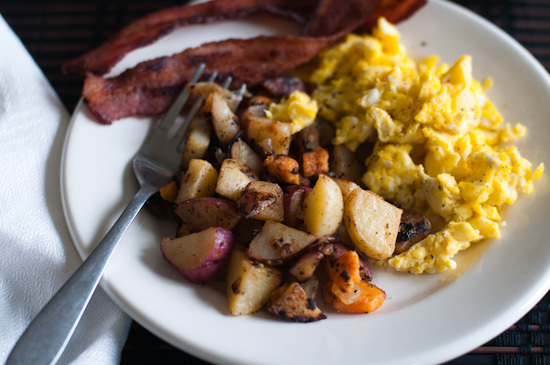 Your family makes breakfast potatoes exactly the way we do.I mix of regular potatoes and sweet or yams, lots of onions and bacon fat or butter, depending on what is on hand. I love the how to photo series. I can see why these are a favorite. What a wonderful treat. Thank you for taking the time to share it with me. I’m sipping on tea and about to start on breakfast…I wish I had something like this to start my day with (but in one way, I do!) I hope you have a great week. Thanks for the props winster. I was surprised to see that you “always listen to my husband.” I certainly have a different perception of that part of the relationship. All the same, breakfast rules. Thanks for posting. I love this tasty dish but surely couldn’t eat this for breakfast: too heavy but as a decent dinner or brunch, would be great for me! yum;)!! I can vouch for these potatoes, having eaten them after a pizza party at the barn. They’re delicious. I think this will just be my favorite recipe for potatoes from now on. I don’t think we had sweet potatoes in them, but everything’s better with yams. I never thought to add sweet potatoes. We do like to add ham to ours and then that’s all we have. Occasionally we’ll add eggs to that too. Those look so good & I’m hungry – not good! I just wanted to say thanks so much for a great idea. Breakfasts are hard for me to be enthusiastic about because I simply MUST have my two coffees within 2 hours of waking up and that kills my appetite for 3-4 hours but this got my attention. Today I forced down a simple breakfast of toast and cheese and another toast and peanut butter and then one boiled egg that was already in the fridge. Then I went out for a 10Klm power walk and when I returned home I cooked this. I forgot the bacon and the garlic because I was so hungry and exhausted and doing it from memory. I also added to the toss / fry mix a small portion bag of frozen veges that I keep lots of in the freezer which included kidney beans and garden peas among the usual suspects. Anyway with a two egg omelette on one side of the plate and everything else on the other side I got stuck in. I can honestly say that was one of the most enjoyable, wholesome and tasty brunches I’ve ever had. I can’t wait for tomorrow. I made this today in the morning and added a bunch of herbs from my garden and it was fantastic! Great flavors, great textures, and great visuals! Have these cooking right now with some chopped onions and green bell pepper! Have the eggs stirred up and ready to cook and the bacon defrosting!! Yay! I can’t wait!! Thanks for sharing! I most certainly will without delay comprehension your current rss feed after i can’t to find your contact monthly subscription hyperlink as well as e-newsletter services. Are there virtually any? Remember to let me understand to ensure I can join. Thank you. Smoked paprika is a WONDERFUL addition. Just sprinkle a little over in the last few minutes of cooking if you are in a hurry. Or if not, mix some powder in with oil in a bowl, then toss the potatoes around a bit (get your hands messy and do some rubbing is best!). I like strong flavours and this really does it for me!